The Right Honourable Paul Martin, Canada's twenty-first Prime Minister, will be on campus on Mon., Nov. 1 to talk about the Martin Aboriginal Education Initiative, which aims at reducing the Aboriginal youth dropout rate and at increasing the number of Aboriginal students attending post-secondary institutions, and about the state of Aboriginal education in Canada in general. Read on for details. 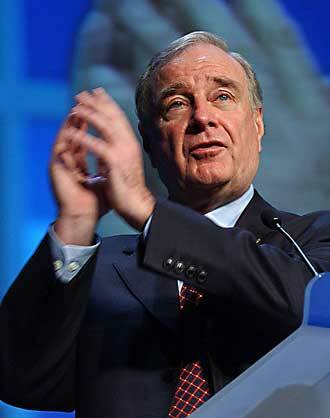 The Right Honourable Paul Martin served as the twenty-first Prime Minister of Canada, as long-time Minister of Finance, and as an MP for almost 20 years. You’d think he might be ready to take a break, but not so: today, Mr. Martin is leading an important new project, The Martin Aboriginal Education Initiative, which aims at reducing the Aboriginal youth dropout rate and at increasing the number of Aboriginal students attending post-secondary institutions. Mr. Martin will be on campus on Monday, Nov. 1 to talk about his new initiative and more generally about the state of Aboriginal education in Canada. The lecture is free and open to everyone. Free public lecture by the Rt. Hon. Paul Martin: The Martin Aboriginal Education Initiative: the State of Aboriginal Education in Canada. Monday, Nov. 1, 2:30-3:30, McGill Faculty Club (Ballroom).